A couple of weeks ago, one of the local quilt shops had an anniversary sale. Here’s what I bought. A good friend is getting married in June, so I’m going to make her a quilt based on the Charm Square Quilt/Disappearing Nine Patch. I’ll cut these gorgeous fabrics, and two from my stash, up into 5″ charms this weekend. I picked up these four as they were on clearance, and I liked them. I’ve decided to jump on the Civil War band-wagon and have ordered the Civil War Diaries and Love Letters books from Amazon earlier this week. It will probably take me a couple of years to complete, but I plan to make the Civil War quilt for my own bed. 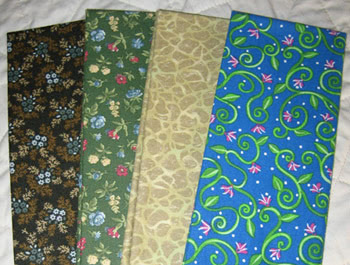 The three fabrics on the left, I’ll put in my potential Civil War basket. I fell in love with these marble-like fabrics, and purchased 12 fat quarters to make my own Magic Tiles quilt.